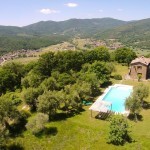 We have a great selection of quality and luxury villa rentals in Tuscany and Umbria, Italy. By browsing through our rental houses we hope you’ll find the perfect property for your Italian holiday. Alternatively, please use our search function to Find Your Perfect Villa. Click on the individual links below to view the larger Tuscany and Umbria villa lettings available through Gorgacce Rentals. All of our larger villa rentals are private and come with swimming pools. The holiday homes are arranged in order of size, starting with four bedrooms, scroll down to find larger properties. If you can’t decide, or don’t have much time, send us an enquiry with your dates and the size of your party. We’ll reply as soon as possible with links to our most suitable Umbrian and Tuscan rental villas. Casa della Maestra is an old school house high above the Niccone and Nestore Valleys on the Tuscany Umbria border. It has a large swimming pool with magnificent views across the valley below. It is in a secluded position and, whether you are are a family group or friends, it will make a perfect base for your holiday in Italy. Located in a hamlet near the village of Montecastelli , you can enjoy days lazing by the pool and enjoying lunch on the shady terrace, a great house for a family holiday. The picturesque hill top village of Montone is nearby as are the towns of Umbertide, Trestina amd Città di Castello. 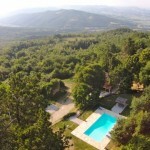 Casa Riozzo is high above the Niccone Valley with fantastic views across the landscape of Tuscany and Umbria. It has a second kitchen and bathroom next to the (fenced and gated) pool (thermal cover) and there is an old tennis court. On the ground floor of the house there is a games room with a snooker table. A perfect house for a family holiday with teenagers. Castellino is a beautiful villa located just below Lisciano Niccone castle. The villa looks across the Niccone Valley to another castle, the Rocca di Pierle. The interior of the house is spacious and well appointed, the grounds are fenced and gated. There is a shady terrace ideal for al fresco dining that looks down on to the pool. San Nicolò is a beautiful villa in a stunning location high above the hamlet of Molino Vitelli in the Niccone Valley. This comfortable and well appointed villa has stunning views and is set in lovely gardens. with a popular restaurant and winery a few minutes’ drive away this is great location for a relaxing family holiday. Villa Vitellino is a large, comfortable holiday house close to the town of Castiglione del Lago and Lake Trasimeno. It has a mature, well maintained garden (fenced and gated) with plenty of garden and poolside furniture. 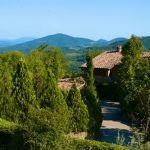 This villa is a great base from which to explore Tuscany and Umbria but also makes a relaxing place to unwind from the stress of normal life. Villa Forconi is a luxurious property furnished and finished to the highest standard. The interior is magnificent, the views are superb, the location on a hillside with fenced and gated grounds is completely private. Need more? Well, the price is also very competitive for such a high quality villa. Casa degli Ulivi is in a commanding position over the Niccone Valley, it has a large swimming pool set in olive groves below an old castle. It is a few minutes’ drive to the villages of Lisciano Niccone in Umbria and Mercatale di Cortona in Tuscany. Perfect for your family holiday in Italy. Ca di Bracco is a lovely restored farmhouse with heated and fenced pool on a hillside above the Niccone Valley. It has wonderful views, is comfortably furnished and is ideal holiday accommodation for large family groups. There is a large shady terrace, wood fired hot tub and table tennis. Borgo Ospicchio comprises two beautiful villas set in the hills of the Tuscany Umbria border. Equipped with outdoor cinema, table tennis, playground and pool / snooker table. Casa Lucati comprises two adjacent buildings, the main house and a converted barn. Both are self contained units, each with a kitchen but they are always rented as a single property with private pool. There are magnificent views from the garden and house. On the lower floor of the main house there is a games room with table tennis, great for both teenagers and adults. Fonticchio di Sopra is a fantastic property finished to the highest quality inside and out. Recently renovated, it has air conditioning, an infinity edge pool with incredible views and six en-suite bedrooms. The living areas are spacious and clever design means that the stylish interior merges seamlessly into the beautifully maintained, mature garden. L’Antico Sorgente has a commanding position just below an old castle in the hills south of Lake Trasimeno. 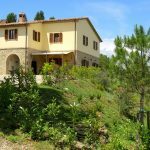 Conveniently positioned within walking distance of a village (Fontignano), where you will find a bar and small shop, the house is comfortably furnished and perfect for a large family group. Casa Luciana is a great holiday location for a large group and is very reasonably priced. It is close to the village of Lisciano Niccone and has a large swimming pool with a wjde paved surround. There is also a large outdoor pizza oven, near the outside terrace, great for al fresco dining.